With the Pope and Curia on the road and off the grid for this week's Lenten retreat, the beat's been unusually quiet... but don't worry – it won't be for much longer. In any case, beyond fresh stories, the coming weeks are likely to bring an uptick of wider focus on the Vatican as Francis marks his second anniversary on Peter's chair. Eventful as the last two years have been, though, it remains the case that the most surreal and extraordinary moment of all hasn't been because of Papa Bergoglio, but the one that made him – the moment two years ago today when the Pope left office alive for the first time since before Europeans settled the Americas and the "new" St Peter's was built. Indeed, as head-spinners go, nothing in the current context – arguably nothing we've seen, ever – can compete with those 17 days in February 2013 between Benedict XVI's announcement of his resignation on the 11th and his departure from the Vatican at dusk on the 28th. 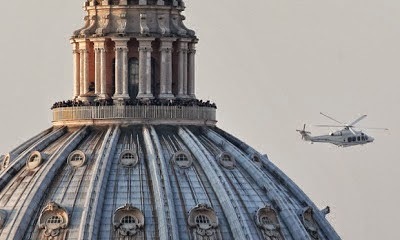 Even if the modern information cycle holds its choicest rewards for the bright, shiny thing of the day – however fleeting it is – this moment deserved and still deserves more enduring attention than it got... and not just because, at some point in time, the reigning pontiff has quietly signaled his determination to follow suit and concretize the renunciation of the papacy in life as a matter of course. "Thank you – thank you from my heart! Dear friends, I'm happy to be with you, that I can see the Creator's beauty around us, and all the goodness you've given to me – thank you for your friendship and your affection! You know that this day of mine hasn't been like those before. I'm no longer the Supreme Pontiff of the Catholic church – at least, at 8 o'clock I won't be – now I'm just a pilgrim beginning the last part of his journey on earth. With all my heart, with all my love, with my prayer and all my strength – with everything in me – I'd like to work for the common good of the church and all humanity. I feel your kindness so much. Let us always move together toward the Lord for the good of the church and of the world. Thank you for bringing yourselves [here] – with all my heart, I give you my blessing…. Pope's Lenten Prayer: For "The Gift of Tears"